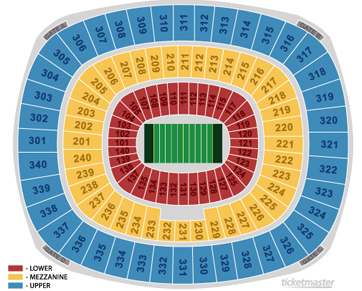 Bid Per Home Game Lower Level Ticket to See Eli Manning & the New York Giants in 2009 at Giants Stadium in East Rutherford, New Jersey! This is a Bid Per Item Auction. Bid for the price you are willing to pay for a single item. When you win, you may request up to 4 items at your winning price. For example, if you win this auction for $10, then you can get up to 4 items for $10 each! You must purchase at least 2 items. See ELI MANNING & the rest of the NY GIANTS in action in 2009! Due to the ongoing construction of the new stadium, ticket holders with a Pre-Paid Parking Permit will only be allowed to park in the stadium lots. Satellite parking and shuttlebus service are available for ticket holders who do not have a Pre-Paid Parking Permit! Note: Winners must take a minimum of 2 tickets and a maximum of 4 tickets. The purchase of 3 tickets is not valid on this offer and any submission for anything other than 2 or 4 tickets will be rejected. NY Giants vs Carolina Panthers @ 8:15PM - Lower Level - on Monday, Aug 17, 2009 (more info) — SOLD OUT! 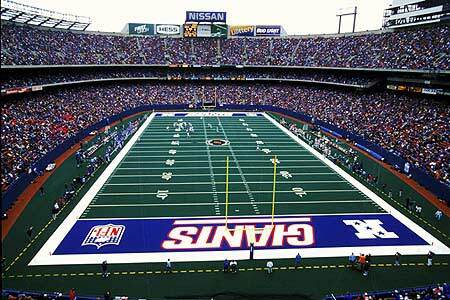 NY Giants vs New York Jets @ 8:00PM - Lower End Zone - on Saturday, Aug 29, 2009 (more info) — SOLD OUT! NY Giants vs New York Jets @ 8:00PM - Lower Level on Saturday, Aug 29, 2009 (more info) — SOLD OUT! The date and time of the game is subject to change by the NFL in accordance with its scheduling policies or as a result of other actions or events beyond the NFL's control. No refund will be provided if ticket holder cannot attend.